I can't stand it! Look at these pictures. They do not do justice to the motive in any way. The whites are tinted red my backdrop looks splotchy. This is even after the fact that I worked on them in Photoshop. Something I did not do often with my Sony DSC F717. Most of the pictures I presented were the actual ones I took. Ever since it got stolen in London, I have become frustrated. You should have seen me with these photos. I now truly feel sorry for the guy who stole my camera. I do not think I have ever cursed and rebuked someone so much! I will not allow that to handicap me and I am still trying to do my very best with the Sony HandyCam I have. Until I do get my new camera I really hope you will forgive the quality of these pictures. I decided to make Piroshki for Soeren's lunch box tomorrow (see The Daily Tiffin). In London, we were in a great Russian restaurant (I'll be reviewing it on The Family Buzz later this week in the London Story 2), which made me think of the Russian piroshki being very similar to our Indian Samosas. It too can be filled with several types of fillings, the most common one being mince meat. I decided to go for something more vegetarian. 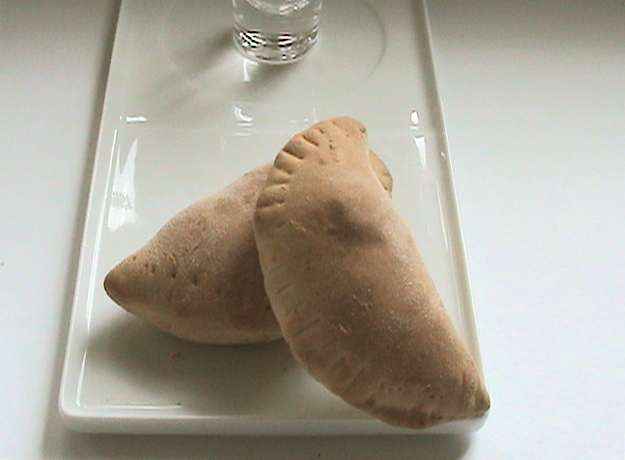 I used canned mushrooms basically because the piroshki gets very dry, but if you add too much fluid it becomes soggy. Using canned mushrooms add just the right type of "wetness" to it. I also only made a very small number of the piroshkis, so you can always add more to the ingredients. I made 4 and had a bit of filling left over. Roll out your dough and cut 4 circular shaped forms. I used a rim of a large whiskey tumbler. Make sure that the circular shaped dough forms are not too thick. Making them thinner keeps them moist when baked. Let is rest for 15 minutes. In the mean time fry the onions in a pan. Add the potatoes and fry for approx. 10 minutes on a gentle heat, until the potatoes are cooked. You can pre-boil the potatoes if you want. I did not, as the cubes are so small that they cook in the pan and later in the oven. Now add the mushrooms, herbs and salt and pepper. Cook for another 3-5 minutes. Remove from heat and add the chopped egg and the sour cream. Mix well. Using a teaspoon add a generous helping of the filling on one side of the dough, keeping the edges free. Fold the other side over the filling, and press the edges together. Press tightly to seal the edges together. Place these in the oven and bake for 15 to 20 minutes. My verdict today and Soeren's tomorrow! These make great party food. I am planning to have a small party before I leave for the US in May and I think these will be definitely on my finger food list. Due to the fact that they were rolled nice and thin and the sour cream and mushrooms kept the entire piroshki nice and moist. I will research the best type of sauce to serve with this, as I personally find the tangy "imli" - tamarind sauce gives the samosa that extra kick. Therefore, I think I have to find the extra kick for the piroshki too! Hope you had a good holiday minus the camera incident ! 1.stewed cabbage with onions -with/or without hard boiled egg. 3.fresh or canned mushrooms stewed/fryed with onions.